If you own a non-stick pan, you might be wondering what makes it "not stick" to your food. Here is a complete guide to the technology, quality and care of non-stick cookware. 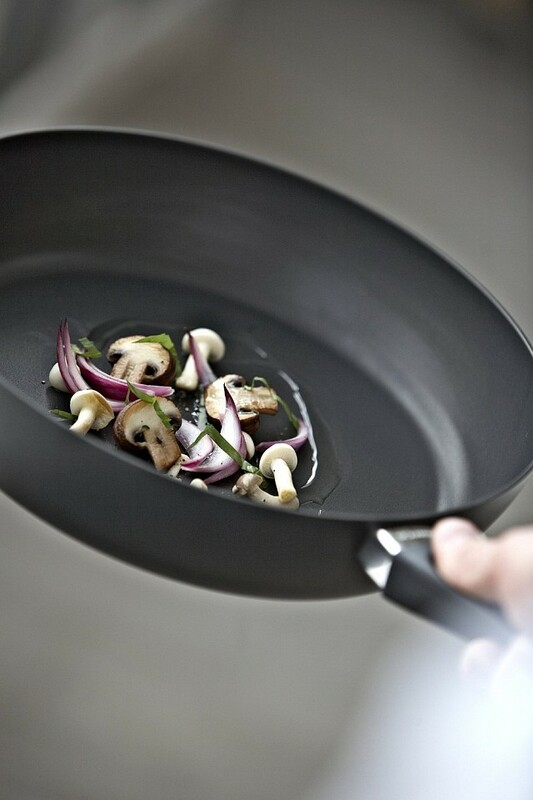 Most non-stick is simply an exceptionally slippery plastic compound applied to the surface of metallic cookware. Lots of people describe their non-stick pans as "Teflon". However, not all non-stick coatings are Teflon. Teflon is simply a brand name for a plastic known as polytetrafluoroethylene (PTFE) and is owned by DuPont. What is PTFE and why doesn't it stick to food? PTFE or polytetrafluoroethylene is a fluoropolymer plastic. Fluoropolymers are compounds that contain fluorine. Chemically speaking, a molecule of PTFE has two carbon atoms and four fluorine atoms which are then repeated throughout the structure. It is the fluorine atoms that shield the carbon atoms from reacting, thus preventing food from sticking to the pan. Are there any non-stick coatings other than PTFE based? Other than PTFE, non-stick for cookware is either silicone based or ceramic/enamel based. Silicone, a synthetic rubber that contains bonded silicon and oxygen, is used mainly in bake ware and kitchen utensils. Ceramic or enamel coated cookware has gained popularity in recent years as "green" or "healthy cookware" because it is free of the chemicals PTFE and PFOA. According to T-Fal, PFOA is burned off during the process and only and insignificant amount remains in the finished product. 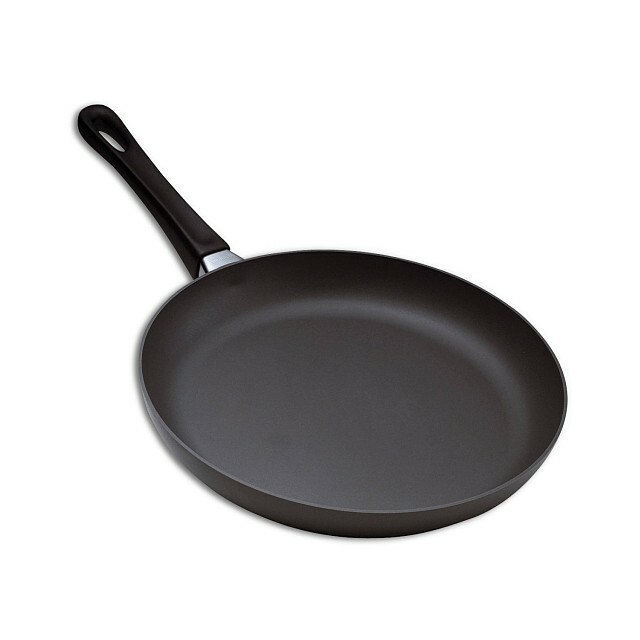 Previously, all non-stick coating manufacturers used PFOA in the manufacture of non-stick. However, PFOA is considered a pollutant and a toxic substance and now, under the stewardship of the Environmental Protection Agency (EPA), most of the reputable non-stick coating manufacturers are producing coatings made without PFOA. The goal is to completely eliminate it by 2015. So when you see "PFOA free" in the marketing message of a piece of cookware, it simply means that the chemical PFOA was not used in the manufacturing process of the non-stick coating, which is usually PTFE or a related plastic compound. There has been a lot of debate about this recently so this warrants some attention. Under normal circumstances, PTFE is an inert substance and even if you ingest a piece that flaked off from your pan, it will simply pass through your body. As a point of interest, because of its non-reactive nature, PTFE even finds use as a medical material in arterial grafts, catheters, sutures, joint replacements and reconstructive and cosmetic facial surgery! However, when it is heated to a high temperature like 500°F, PTFE starts deteriorating and releasing fumes which have been found harmful for birds and cause flu like symptoms in humans. In ordinary use, pans are not usually heated to such a high temperature. So in a nutshell, yes, PTFE or Teflon is safe as long as you are diligent about not heating an empty pan or cooking on too high a temperature. What determines the quality of a non-stick coating? The quality of a non-stick coating is defined by 3 things: the quality of the coating itself (the formula), the number of layers and the thickness of the layers. 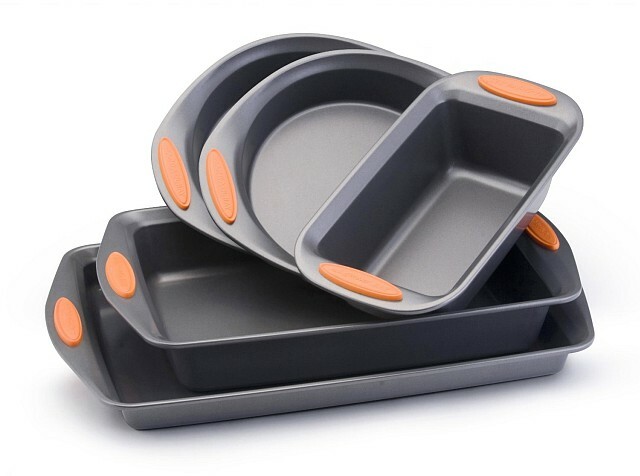 3 layers is the minimum for a good quality pan with one cookware brand even offering 7 layers. As an example, the Rachael Ray non-stick cookware uses Eclipse, a top-of-the-line, reinforced non-stick coating that is sprayed on in 3 layers. The non-stick release is provided by the top layer which is... you guessed it... PTFE! Another example, T-Fal Professional Total Non-stick has 5 layers of non-stick coating on it. Non-stick finishes can be sprayed or rolled on to the metal pan. The best non-stick coatings are sprayed on and are absolutely smooth to the touch. What determines the durability of non-stick coating? The material of the pan to which the non-stick coating is applied. Generally, a coating on a hard anodized aluminum pan will last longer than on a plain aluminum pan. And a plain aluminum pan will last longer than an enamel-on-steel pan with the same coating. The thickness of the pan. The thicker the pan, the better the heat distribution and protection of the non-stick surface. The application method. As mentioned earlier, sprayed coatings are better than rolled on. Look for a brand name that is recognized for quality non-stick products. How do I take care of my non-stick cookware? Always use plastic, wooden or rubber utensils during cooking to maximize the life of any non-stick cookware. Clean with warm soapy water and a soft sponge or wash cloth. No abrasive metal cleaners. Cook on low to medium heat. High heat can cause foods to stick as well as breakdown the non-stick coating. Don't use cooking spray as it burns at lower temperatures and can burn into the non-stick coating causing build up of the spray. This will cause sticking and damage to the non-stick coating and sometimes give the cookware a "rusty" appearance. Even if a non-stick pan says dishwasher safe, it is always recommended to wash it by hand. Don't store food in non-stick pans. This article is provided courtesy of The Cookware Advisor, a cookware reviews site for all major cookware brands, including celebrity cookware like Emerilware and Rachael Ray cookware. Even though I follow all your steps for maintenace of non-stick cookware, I find that giving the Teflon a spray of Easy-Off oven cleaner, letting it soak in for 5 minutes, then a gentle scrubbing, does wonders to restore the non-stick. I only do this once a month, if that, though. Be careful using the spray!!! It will tarnish aluminium and and anodized surfaces. Did you also have a look at Scanpans? Ceramic & titanium fired into the pan when the pan is made ~ no PFOAs, no coating to come off. Can use metal utensils on Scanpans, sear and put into the oven. Great stuff! I'm a big fan of Scanpan. My only two non-stick pans are a 12.5-in and a 9.5-in Scanpan frying pan. I did have an older 9.5-in start to have tiny bits flake off after a couple years of usage, but they replaced it free of charge. They heat relatively evenly and are a breeze to clean because the PTFE coating extends to the outside down to the aluminum base. In fact, I like Scanpan so much, I replaced a couple of the original pictures sent with this article with photos of Scanpan pans. I like (Teflon) non-stick best in an electric skillet. The crude temperature control prevents over-heating, unlike pans used on stove-tops. I've been able to keep non-stick coatings good for many years, plus the whole unit usually costs less than a pan and comes with a lid. Not high-brow cookware, but very handy. Within a year I will over-heat a non-stick pan and it will gradually lose the magic, which is fine since I don't buy expensive ones-- I just consider them semi-disposable. Really well-seasoned (read: "oily") cast iron can be less-sticky than reactive cookware like stainless or enamel, and I use that the most. I have a small Scanpan skillet I bought a few years ago in an Amazon sale and love it as well. It has developed a few scratches on the surface (even though I am ridiculously careful when using and cleaning that expensive little bugger), making it slightly less than non-stick. Anyway, if they offer free replacement, I'd love to take them up on it but am having a hard time figuring out who to contact -- did you have to return the pan to Denmark or is there an American branch that I'm not finding? The Scanpan USA warranty is duplicated here for your convenience. SCANPAN USA, GUARANTEES THE QUALITY OF THE PRODUCT TO BE FREE FROM MATERIAL AND MANUFACTURING DEFECTS FOR THE LIFETIME OF THE PAN BY THE ORIGINAL PURCHASER IN THE USA, WITH PROOF OF RECEIPT. SCANPAN USA WILL, AT IT'S SOLE DISCRETION, REPAIR OR REPLACE PRODUCT THAT IS RETURNED TO SCANPAN USA UNDER THIS WARRANTY. THIS IS NOT A CASHBACK WARRANTY. DAMAGE CAUSED BY MISUSE OR ABUSE IS NOT COVERED BY THIS WARRANTY. THE WARRANTY OVERVIEW WHICH SHOWS JUSTIFIED AND UNJUSTIFIED DEFECTS, CAN BE OBTAINED FROM THE SCANPAN USA CONSUMER SERVICE TEAM. FOR ALL WARRANTY-RELATED ISSUES IN THE UNITED STATES, PLEASE CONTACT SCANPAN USA CONSUMER SERVICE AT 877-772-5467, MONDAY THROUGH FRIDAY 8:00AM - 5:00PM. YOU MUST FIRST CONTACT SCANPAN USA CONSUMER SERVICE TO RECEIVE A RETURN AUTHORIZATION PRIOR TO SENDING IN A WARRANTY CLAIM. ANY WARRANTY CLAIM THAT IS RECEIVED WITHOUT AN RA WILL BE RETURNED AT THE OWNER'S EXPENSE. is this an advertisement for the wunders of the lawyer or what? a 2015 article on PFOA stuff that has been known for more than a decade and already addressed by EPA, etc. I think this article demonstrates the lengths industry will go to to hide the bad stuff they're responsible for. A lesson to us all to keep asking questions. In December 2011, after seven years, the scientists began to release their findings: there was a ��probable link�� between PFOA and kidney cancer, testicular cancer, thyroid disease, high cholesterol, pre-eclampsia and ulcerative colitis. As of October, 3,535 plaintiffs have filed personal-injury lawsuits against DuPont. The first member of this group to go to trial was a kidney-cancer survivor named Carla Bartlett. In October, Bartlett was awarded $1.6 million. DuPont plans to appeal. This may have ramifications well beyond Bartlett�s case: Hers is one of five ��bellwether�� cases that will be tried over the course of this year. After that, DuPont may choose to settle with every afflicted class member, using the outcome of the bellwether cases to determine settlement awards. Or DuPont can fight each suit individually, a tactic that tobacco companies have used to fight personal-injury lawsuits. At the rate of four trials a year, DuPont would continue to fight PFOA cases until the year 2890. I think everyone should watch the documentary that is now on Netflix called "The Devil We Know". We need to educate ourselves and stop buying these pans that basically poison you. I threw out every pan except 2 that I owned after watching this show. It's disgusting Dupont knew what was going on and didn't care what was happening to people. It's all about money to them. It's disgusting. the problem with your outrage is: it's several decades after the problem was identified and remedied. and since the patent expired, DuPont has been a minor player in the production of PTFE. basically there's little concern on cookware - but if you want to get upset about something, you'll find children's fire retardant sleepwear is loaded with PFOA. Post a comment on What's In Your Non-Stick?